. Craig Edwards has returned to his home planet of South Australia in an attempt to rescue his friend Dave Onley from the clutches of the vile gangster Pizza the Hut. 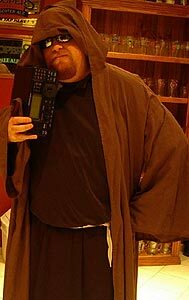 Little does Craig know that the galactic empire (regular society) has secretly begun construction on a new armoured space station (a new job in South Australia) even more powerful than the 1st dreaded death star (previous job in Townsville). 43 countries on this trip? Impressive, most impressive. 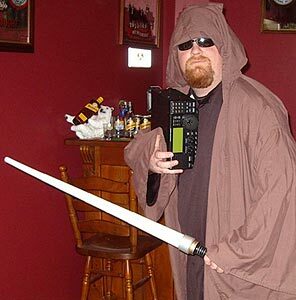 The Force is with you young DXpeditioner, but you are not a DXer yet. Once completed, this ultimate career will spell certain doom on the small band of rebel DXers struggling to restore AM Broadcast Band listening to the galaxy. 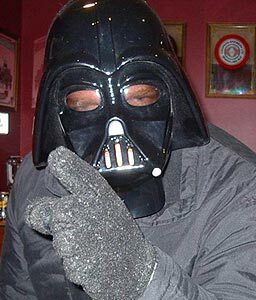 .wife, career, non-DX friends - the dark side are they. Once you start down the dark path (regular society), forever will it dominate your destiny. Do not underestimate the powers of the employer, or suffer your fellow DX-guys fate will you." May the propagation be with you. 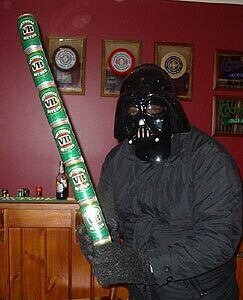 Jedi master 'pass-a-can-of-beer-to-me' has taught you well, you have controlled your fear of becoming a DXer. That's right R75, we're going to drive to the Coorong system, I have a promise to keep to an old friend. 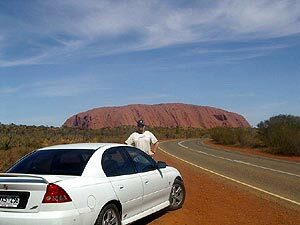 The huge journey starting at Townsville, travelling to Katherine & then heading south with a slight detour to Ayers Rock en route to Adelaide. The previous day my wife and I finished sending all of our belongings on a freight truck back home to Adelaide in South Australia for us to settle there permanently. We decided to spend our last night in Townsville at their Casino and enjoy our last mango daiquiri cocktail in Tropical Queensland. This was certainly a time to reflect on the great DX heard in the previous 10 months and confirm that my decision to return to DXing after a nine year absence was certainly the right decision. The only regret was that I didn't have the chance to spend more time DXing there. At that moment I made a promise to myself that on return to Adelaide I would continue DXing. 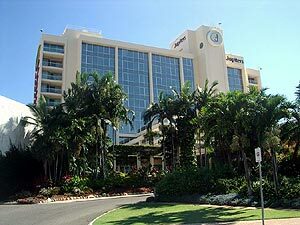 My wife and I jumped in our car and departed Jupiters Casino with the plan to spend 14 days on the road driving through North West Queensland, the Northern Territory and through South Australia to make it to Adelaide in time for the V8 Supercar Festival which is another passion of mine. This first stint of the trip was certainly a long one so I took the opportunity to read printouts of past DXpeditions from Grayland, Newfoundland, Miscou, Lemmenjoki, Kongsfjord, Long Beach Island and from around South Africa to get me in the mood for the next couple of weeks. We pulled into Mount Isa at 530pm. Fortunately I'd been to Mount Isa before for work only a few weeks back so I knew exactly where to go for a meal, accommodation and a DX site for the morning. After a pepperoni pizza and a couple of XXXX beers I checked the equipment and found myself hitting the wall by 830pm, hmmmmm must have been the 9 hours driving!! Needless to say you need to look out early for road trains - better pull off to the side of the road bloody quickly! I quickly jumped out of bed at 5am (1900 UTC) and headed out to the same spot as a month back with 200m on the ground to the west and was at the radio tuning 40 minutes later. On reflection this was probably one of the best mornings of the trip due to low noise levels and very favourable conditions to Africa and Europe with the highlights being Botswana 909; Lesotho 1197; Mayotte 1458 & Sao Tome 1530 and then well after sunrise up popped a couple of European Russians on 1089 & 1170. 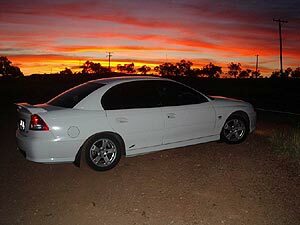 The only problem I faced now was that we had a 663 km drive to start in an hour's time, so I quickly packed the car, headed back to the caravan park cabin to shower & get ready for driving. 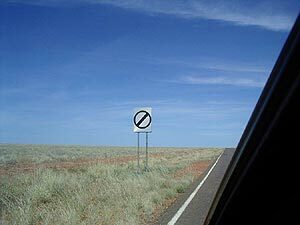 We departed Mount Isa by 9am local with my wife doing the first driving stint while I tried to grab some shut eye. Mind you I found myself awake as we drove along one of the worst stretches of road that could possibly call itself a supposed highway. How the 50m (170ft) long road trains are supposed to navigate this dual carriageway when it is virtually the width of a single lane is amazing. 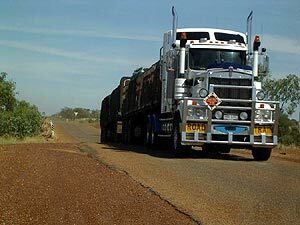 In the distance whenever we saw one of these monsters we'd have to pull over on the side of the road as it roared past at 100kph/60mph and it's last trailer would often be waving side to side like the tail of a brown snake. Oh yeah, this road also went through unfenced cattle stations so the walking beef burgers would often be wandering on the road - fun!!! 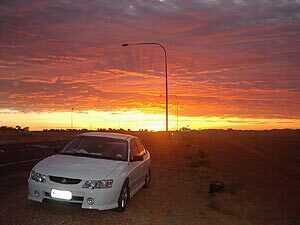 However as soon as we hit the Northern Territory border the road was sensational. 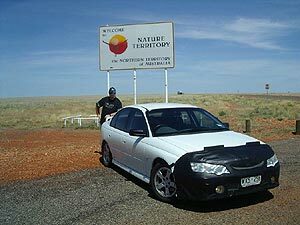 This was a good thing too because there are no speed limits in the NT. I couldn't jump behind the wheel quicker to set the cruise control for 140kph/90mph for this cannonball run - yehaaaaw. By 4pm we'd completed the drive to Tennant Creek and having never been to the NT it now meant that every time we'd pull into a new town I'd have to find a safe and suitable DX location for sunrise listening in the car which was close to the caravan park because there were many many kangaroos to negotiate with at this early hour. I found a DX location for the next morning on a hill overlooking the town and it just so happened to have an access road straight enough for a 200m wire to North Africa. This sign means 'no speed limit' - time to start the cannonball run. After a 5am wake up call I was at the radio by 2000 UTC. There were no sensational catches but Euro highlights of Cyprus 1233 & France 1557 were a good sign and the band was exploding with Philippines stations at amazing strengths that lasted until 8am, an hour and a half after local sunrise. The only downside to the morning was a hose reel malfunction causing the wire to tangle quite badly and it took a good half hour in the heat and millions of post sunrise flies to sort it out. So that was all for Tennant Creek, we'd be there again in a few days but it was now time to head north to Katherine. So after a well deserved shower & bacon breakfast after the tangled wire incident, we were off by 10am. We pulled into Katherine by 430pm and I decided to choose a spot just a couple of minutes from the caravan park for my morning listening session. 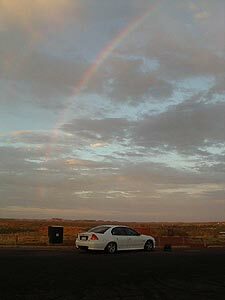 DXing under the rainbow in Tennant Creek - the pot of gold? - that would be Djibouti 1431 kHz. A key factor learnt from the previous morning was that because I was so far north, as soon as 2000 UTC came around, the band was full of sign ons from the Philippines and western China CNR outlets. So to hear Europeans and Africans, I would have to beat the clock and start waking up at 4am (sigh) and be at the dials by 1900 UTC to give me an hour before that Philippines national anthem would start firing up everywhere. Reception conditions were very different from the previous two mornings logging Russia 1494; Moldova 1548 & Lithuania 1557 with no sign of any Africans, but then 2000 UTC swung around and it was time to play chase the new Filipino. Another difference was that the band was totally dead by 700am (2130 UTC), the previous morning the band was still going until 800am (2230 UTC). This was the first day of the trip that we weren't driving to another major centre so it was a chance to catch up on laundry and some well earned sleep. I tried to do some early evening listening for Asians but just like the previous evening, a spectacular array of lightning in the area put an early end to those efforts because only the strongest could survive the crashes and it probably wasn't a good idea in terms of possibly toasting the little R75. 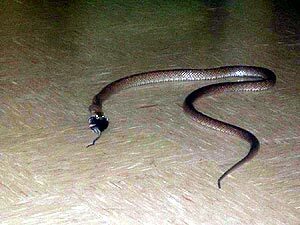 There's nothing like coming across a brown snake feeding on a stray mouse in the Katherine tourist park laundry to get your heart pumping!!!!!! Without the burden of a day long drive like in previous mornings it was easy (?!??) to wake up at 330am and drive out to the roadway outside the caravan park to put out the wire and hit the dials by 4am'ish (1830 UTC). Unfortunately the remnants of the previous evenings lightning storms in the tropics were still about as in the distance the occasional white explosion of lightning in the sky could still be seen. This meant that the noise levels were way over any faint Afro or Euro signal so I went to plan B and had a great time chasing Philippines station sign ons and getting some more detail on logs from previous mornings, mind you the late showing of Cyprus 990 was a new station for me and a pleasant surprise. Later on that day we did the touristy things as my wife and I visited beautiful Edith Falls and I was tempted to dive in as the weather was very much like Townsville - very hot and very humid. Then we spent the afternoon on a sensational cruise along Katherine Gorge with numerous Crocodile sightings to again remind me of my 'old home' of Townsville. In the late afternoon on the way back to the caravan park I decided that it was safe enough to leave the wire out rather than setting it up in the dark of morning. Sitting in the pool in the tropical pool at Katherine - funny enough I was reading an article on the Lemmenjoki Dxpeditions in the snow. I woke again at 330am only to find the same scenario with the lightning and high noise levels as on the previous morning. There were no new Afro, Euro or even Middle Eastern stations around so I spent the morning hunting new Philippines stations that I hadn't heard before in Townsville and managed to get DWIZ 882, DXIM 936, DYTR 1116, DWDD 1134 and DZEL 1260 reported in the log so the morning wasn't a complete waste of time. Mind you I was starting to get a bit nervous that Katherine was a waste of time and that I should have spent more time in Mount Isa or Tennant Creek rather than Katherine - aka Lightning Ridge! With this being the last day in Katherine I thought I'd head out to the wire outside the caravan park in late afternoon to see what could be picked up from Asia. I noticed some rather loud crackles on the band resembling lightning strikes, so I got out the car and there was lightning coming from every direction. I quickly disconnected the wire and stood in awe as thunder started to roll in and I was surrounded by distant 'sheet' lightning. This was sensational to watch but not really conducive to DX. An hour or so later it was scary in an enjoyable way as back in the cabin my wife and I experienced the most violent electrical storm we have ever seen. The forked lightning was blinding and the thunder so severe it rattled not only the windows but the walls too. There were blackouts and torrential tropical rain bursts mixed with night time temperatures as hot and humid as in day time. So as I eventually drifted off to sleep I pretty much knew that the next morning was going to be a chase the Filipino ID one, if anything at all. I had visions of the remains of my antenna being a black line in the bushes as a lightning strike vaporised it! Friendly little furry critter encountered while pulling in the wire one morning in Katherine. hmmmmm might want to get to the antenna site ASAP!!!!!! After quickly weaving around startled wallabies and kangaroos in the car, I was delighted to find that the noise levels were way down and lightning crashes were all but gone and this coincided with good conditions to Africa. I switched the R75 to 909 and VOA was huge overall but with deep fast fades. Unfriendly little scaly critter encountered while pulling in the wire one morning in Katherine - excuse the poor zoom in - I wasn't getting any closer for fear of shitting myself!!! A quick check of 1458 and 1197 saw action too but they were already in the log so I headed to 1377 in hope. I've been trying every morning previously to try and hear Tanzania here with no luck and by 2000 the CNR China outlet takes over on this channel. There was life on the frequency but it was tough. So I decided to sit on it as I was determined to be patient and wait for something to happen over the next hour or so before 2000 UTC. This moment was the highlight of the trip probably because the signal was so tricky and because I wanted this one so much. But sure enough the Radio Free Africa ID in English made it all worthwhile and for good measure Swaziland in Portuguese appeared to join the party. So while the extra days at Katherine was probably a failure in terms of the DX heard from Europe and Africa, I was certainly buoyed by the 1377 kHz experience. Time to head south back down to Tennant Creek again. 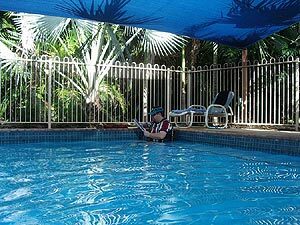 After the previous visit to Tennant Creek a few days ago I didn't have to worry about searching for a DX site so there was nothing to do but sit in the tourist park pool and reflect on what had been heard. I also tried for some Asian signals in the early evening while my wife went to bed early after our long drive, mind you I could have done with the sleep too at that stage. 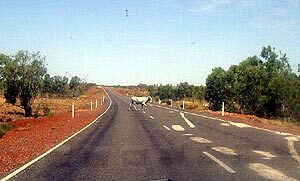 No speed limits and unfenced roads on cattle stations - aaaah ya gotta luv the Northern Territory. I was welcomed by a relatively noise free morning and the effects of lightning crashes were virtually non-existent. On this morning I enjoyed different conditions to any other previous morning of the trip as there was a sensational opening to Northern Africa and the Middle East which resulted in loggings of Oman 1242; Sudan 1296; Cyprus 1323; Kuwait 1593 and my much sought after Djibouti 1431 (finally!!). So with another successful morning it was time to head further south to a new town - Alice Springs. 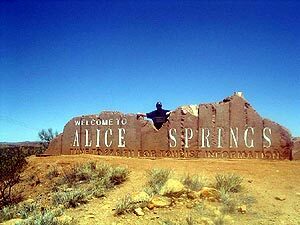 No I didn't do a reception report for Alice Springs 87.6 MHz FM Tourist Information Radio - I'm not that much of a weirdo. The tourist park we stayed in didn't really have a good site for DXing so the maximum antenna length tried was only 100m (300ft) and this coincided with a fairly noisy area and ordinary conditions too I feel. So I spent the morning looking for unheard Western Australian stations. Mind you there was plenty to see and do in Alice Springs so the tourist side of things was a lot more enjoyable than the mornings DX. 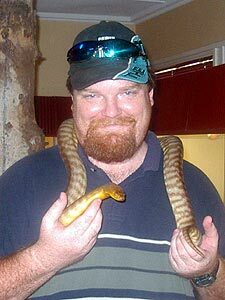 The experience of putting a live snake, albeit a non-venomous one around my neck was a tad unnerving - leaving Townsville meant the Crocodile DX Hunter character was over - so what the hell was I doing! Especially how my wife kept reminding me about all the Snake Wrangler TV shows where he got bitten by a cranky python - I just told her to shut up and take the bloody picture. Figuring that DX possibilities with the current antenna set up on the following morning was going to be ordinary and that the next drive was only 443 km, we figured it was time to go out for dinner. So we found a nice restaurant in 'walking to' and 'staggering from' distance from the tourist park and enjoyed some sensational Barramundi from the Top End and Coopers Ale which I hadn't sampled since being in South Australia a year ago. Amazing how a smile on the outside hides a DXer about to piss his pants on the inside. Well my 9th pre-dawn wake call came around again and this time conditions were better, mind you they couldn't have gotten much worse than the previous morning. A few more Asians in the log but nothing much to write home to Santa about. Now it was time to visit one of the most recognised international landmarks in the world - Uluru or Ayers Rock. So we did the typical touristy things despite of the 40oC heat. At least we were far south enough to avoid the tropical humidity which we had experienced in the first instalment of the travelling DXpedition. I was happy to be south because on Northern Territory television and radio we were constantly being reminded of Tropical Cyclone Ingrid which was blasting across the Top End. Instead we had a beautiful dinner at Ayers Rock Resort of Red Back beers and enough prime beef and baked potato to pack most of my arteries. I did the usual 330am wake up call but this time my wife tagged along because my listening location was in view of Ayers Rock and she was keen to see this early morning phenomenon as did hundreds of other tourists. So this was the first morning of the DXpedition where I wasn't alone in being the only clown awake so early. Unfortunately I could only string out 100m here and like Alice Springs, there was nothing much new around on such a 'short' wire. Getting to our next outpost was pretty easy as it was only a quick 2 hour drive to Erldunda 242km away. At a place that only had (1) a motel, (2) a petrol station and (3) a pub, it was pretty easy deciding what to do. (1) check into the motel and put out the wire, (2) fill the car with petrol, and (3) goto the pub for Bundy Rum & a chicken schnitzel. Goodbye Northern Territory and hello to the old home state South Australia. After 3 ordinary mornings on a shorter antenna, I was pleased to be able to get 200m/660ft out to Europe and this enabled a couple of new catches for me like Yemen 760 and Greece 792 so that was a nice surprise. 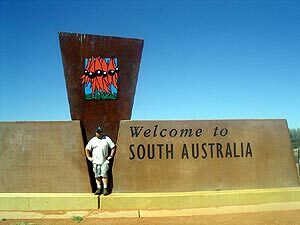 A little later we ventured off to leave the Northern Territory only to cross into our home state of South Australia. At this time it certainly felt like our move away from Townsville really hit home. We arrived in this odd place of Coober Pedy. It's odd for so many reasons but no more so that the majority of houses are underground to escape the stifling heat. Well it was time to head back home to Adelaide and while I was sad to end the travelling DXpedition I was glad to have a rest. It was an exciting time to return home to Adelaide as we planned to arrive in time for the 4 day V8 Supercars Racing Festival - the Clipsal 500. After a month of solid DXing, first at Townsville (and then this trip, it was nice to have a non-DXing diversion. I have to make the clear point that this DXpedition wasn't your typical annual week long expedition at an ideal coastal site with an array of long beverage antenna. 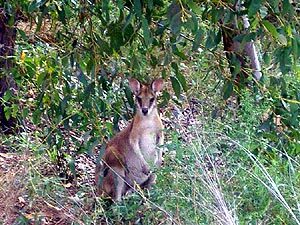 In fact if I wanted to go anywhere in Australia to hear Europe and Africa I would have chosen a site on the coast of Western Australia. This DXpedition was simply a way to get myself and my wife from Townsville to Adelaide as we relocated from tropical Queensland to the capital city of South Australia. 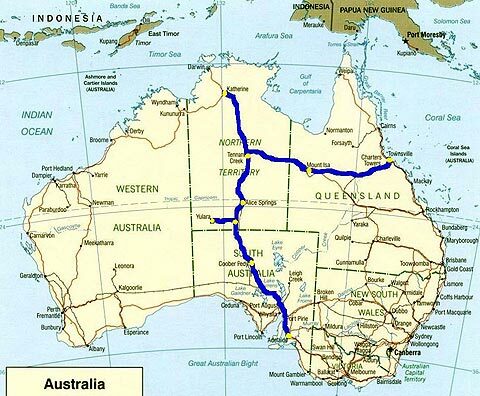 So you see this DXpedition really didn't need to happen, we could have simply flown to Adelaide in a day as opposed to a 14 day road trip over 6000 km (3700 miles). But given the choice of flying and hearing nothing or driving and hearing 131 stations from 43 countries including 4 new countries makes this trip an obvious winner. It confirmed the theories yet again of the benefits of a coastal location as opposed to an inland one as experienced on this trip. While a number of good logs from Europe, Africa and the Middle East were made, the strength wasn't as solid as reception of such stations from the Coorong back when I DX'ed there in 1993-1996. So the bottom line is - if you're planning a DXpedition from scratch, make sure it's on or very near the coast. One thing I did learn that you really don't appreciate until you do it yourself is the effect of DXing in the tropics of Australia. We were at the end of the summer wet season but still the effects of late afternoon lightning storms and high crashing noise levels on the band were still a big factor which would at least normally quieten down in the morning. 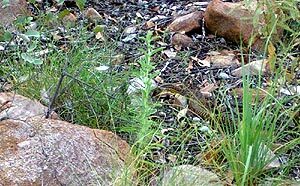 This was a slight to moderate problem when I was chasing North Americans in Townsville and a similar thing happened while in Tennant Creek. These cities are on a similar latitude but the effects are much much worse at the more equatorial latitude of Katherine. The lightning factor was so bad that it was simply too unsafe to listen in the evening and the effects of static crashes still lasted at sunrise. Another factor was that my attempts of going after the prize European and African catches was severely impeded at 530am or 2000 UTC as the Philippines and western China CNR outlets would sign on. While this was enjoyable to hear and log, the main target was Euro & Afro, not Filipino. My experience of DXing from Katherine in the north to Coober Pedy in the south revealed that a latitude of around Ayers Rock was north enough to be away from the concentration of south-east Australian stations yet not too north to be dominated by the Philippines and the tropical storms. Of course later in the year in winter would also reduce the thunderstorm factor. ..and my wife can't believe I'm still keen to stick with the hobby, I think she was secretly hoping I'd go into a DX retirement village in Adelaide! Listening locations - all listening done with an Icom R75 and cassette tape recorder in my Holden Commodore by the road side with antenna laid on the ground.